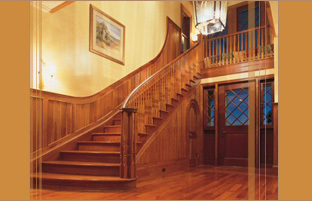 Millwork Concepts, a division of RL Industries, has been manufacturing high-end mouldings and doors since the mid 1980’s. Millwork Concepts operates on the principle of employing the best craftsmen available, using quality tooling and materials, and manufacturing to the customer's specifications. Whether it is matching the profile, the stain color or the species, Millwork Concepts is committed to providing a product and program that is truly unique in a “one size fits all” industry. Millwork Concepts manufactures transitions and mouldings for the hardwood flooring industry, supplying manufacturers, distributors and dealers across North America. Millwork Concepts is highly experienced with the exotic species, special profiles and unique finishes that have entered the hardwood flooring market. Our designers can quickly create moulding knives to match customer specifications. We also manufacture true hand-scraped and distressed mouldings, stair parts and doors to meet a wide range of customer needs.